Creating works of art from acrylic systems is an acquired skill. Our three guest artists have different methods for creating their crafts, but if you follow their steps you’ll be on your way to mastering your own dimensional designs on fingernails. With the impending wedding season in mind, MONI LEIPER shows how to make calla lilies, a favorite in wedding bouquets. Step 1: Peel the inside dot of a form from its backing. Use your thumbs to shape it into a teardrop, and press the large end on a flat, flexible cutting mat (which can be purchased from most cooking –supply stores). Dip a wet brush into white and dab it into bright yellow, so just a little yellow sticks to the edge. Step 2: Press the bead onto the form. Set the yellow at the tip of the form, and starting there, make a point for the calla lily. Start pushing the acrylic over the edge; that will create a curled look for the petals. Step 3: Cut the acrylic down the middle, so that it takes on a heart-like shape. Step 4: For the center, or pistil, of the calla lily, take a bead of yellow and roll it in yellow glitter. Using your brush, shape it on the inside of a form. Step 5: For the leaves, use three shades of green. Touch your brush on different side for each color. The variety of colors will give the leaves more depth. Shape the leaves in either a diamond or teardrop shape. Step 6: To adhere the flower to the nail, use a ball of green and white to go with the base of the flower and leaves. Put a base of yellow inside the Calla lily to hold the center of the Calla lily. Place the pistil in the center. As graduation season grows near, you can start practicing now to get down a quick and easy nail art design for your local grads. LEIPER used blue and white to illustrate how to showcase school spirit. Step 1: For the curved part of the cap, cut and curve part of a form. Cut another small strip to stick in the middle of the curve. That will support the widow’s peak in the cap. For the mortar board of the cap, cut a square from another form. Dip into the base color. Dry the brush to help the acrylic stay where you place it. Press this over the form for the base. Place another, smaller bead to free from the widow’s peak. Step 2: Using a wetter bead, make a square on your precut square. The grid should help in sizing. If the edges are imperfect, scissors can be used later to clean up the edges and sharpen the lines. As the acrylic is curing, cut the materials for the tassel. Coated wire or thread can be used for it. 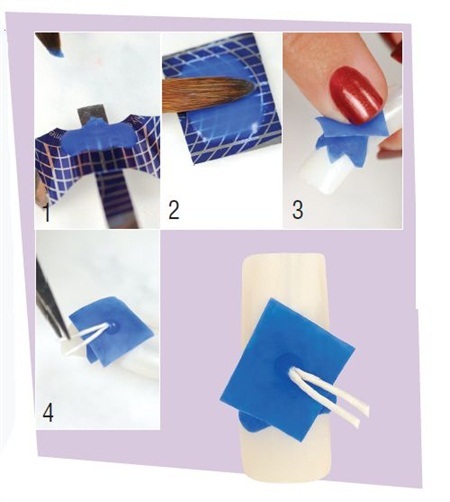 Step 3: Using a drop of glue, place the cap’s base to the nail. Use scissors to clean up the edges of the mortar board, and push it onto the base of the cap with the same glue. Step 4: Place a small, dry bead in the center of the mortar board, and stick the cord or tassel onto the bead. Using the flat mat, LEIPER created a quick and simple butterfly. She prefers using a mat to the forms, but she uses the inside circle of forms as a guide for size on the mat. The tiny creature she crafted can be made in about five minutes using the following steps. Step 1: Get out all the colored acrylics that will be used. Double dip your wet brush in the peach first, then in the pink. Flatten the bead. Using the brush, cut the flattened acrylic down the middle. Continue pressing it down. Step 2: Now, do the same process, upside down. “A butterfly is basically a heart with another heart,” Leiper says. Once the two hearts have been pressed out, clean up the edges with the brush. Step 3: After about two minutes, peel the butterfly from the mat. It’s ready if it “pops up” when the mat is bent. Use the non-bristled side of the brush to push in the centers of the wings to give it shape. Step 4: Using black acrylic, make the antennae off to the side. Shape them with the brush. Step 5: As the antennae are dying, use a tiny bead to attach the butterfly wings to the nail. Use a striper to create the body. Step 6: For a little sparkle, brush a high-shine, thick top coat over the area of the wings, then put a drop of top coat off to the side. Dip in it and pick up a gem to add to the wings. Continue adding gems to your discretion. Step 7: Peel the antennae off the mat. Adhere them by using tiny dots of black acrylic. Get in the know. “Know your colored powders and which ones allow more flexibility,” says Leiper. 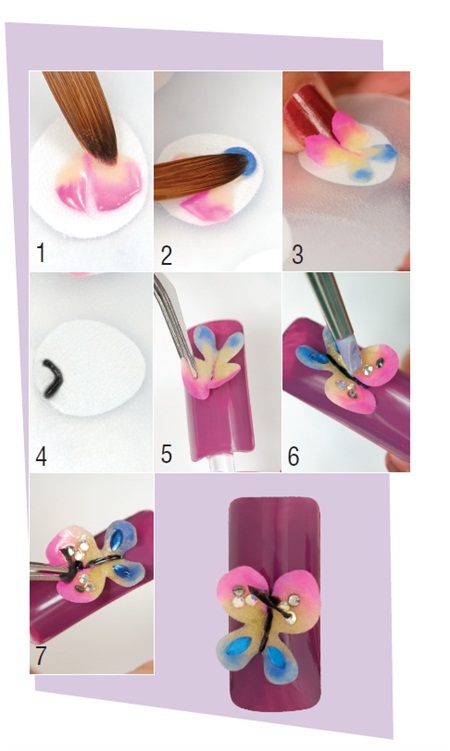 The more pliable a colored acrylic system is, the easier it is to create 3-D nail art. Ones that cure and don’t allow networking, even after rewetting, shouldn’t be used for 3-D work. Take a basic cake decorating class. “It enables you to see shape and from in three dimensions,” she says. Once you struggle over making a big creation, the smaller, nail-sized one is much easier. Even now she still sometimes make rough drafts of her nail art on cakes or cookies. Think in increments. “Always try to think of everything in five-or 15-minute blocks of time,” Leiper advises. That helps you focus on how “perfect” your edges should be and how much you should be charging for the services. Use less for less time. “The fewer the colors, the shorter the time frame, “Leiper says about whittling down time in a salon. In a time crunch, a rainbow of colors should be avoided. KATHLEEN M.M. WOOD used her acrylic prowess to create a purple, pansy-like flower. Instead of using colored acrylics, she opted to paint the acrylic to create the color and depth. Here, she explains her process. Step 1: With a sculptured nail form, create a circle around your finger (like you’d do with tape). Pick up a medium-size, semi-dry bead of white acrylic and put it on the form. Shape into a leaf. Before it dries, use the end of your brush and press in the acrylic. Use the grid on the form to make three leaves about the same size but angled different ways to get different curves. On the nail put a bead of semi-dry clear acrylic where you want the leaves to go. Peel the dry leaves off of the form and place on the nail. Let everything dry. Step 2: Just as you did with the leaves on the form, make the petals. First, make heart shapes at different angles but keep them broad in shape. Make five to six petals. When they are dry, peel them off and use clear acrylic to attach them in the center of the leaves. Hold the petals up so they don’t lie flat on the leaves. Let dry. Step 3: Repeat step 2, but make four petals that are a little smaller in size. Attach the petals using the same process, but off-set them the bottom ones. Again, hold the petals up at an angle. Let dry. Step 4: pick up a larger, dryer bead and place it in the center of the flower. While the bead is still pliable, hold the whole nail upside down until set, to give the center a domed shape. Step 5: Paint the sculpture. Don’t forget the underside of the petals. 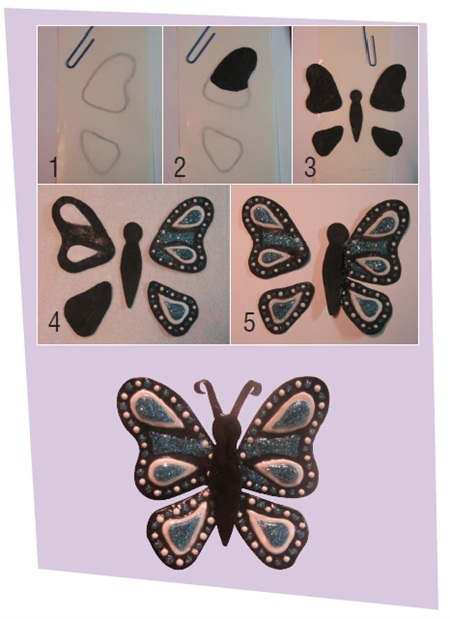 SHER KRUEGER created a life-size black-and-blue butterfly. The same method Krueger used can be scaled down to create your own nail-sized insect. Step 1: Draw one side of the desired shape of the butterfly wing and body on white paper. Trace each section of the wing and the body with a black marker. Lay a section of paper backing from sculpting forms over the pattern (slick side up). Position and use paper clips if needed to secure it. Step 2: Using medium beads fill in the first section of wing. Make sure the beads are dry enough, so the product doesn’t run outside the lines. Blend after adding each bead. To do the opposite set of wings, turn over your original pattern and repeat as above. This will create a mirror image of wings. Step 3: Use the same technique to fill in the body section. Step 4: With drier beads in colors of your choice, embellish the wings using the same techniques as above. Step 5: Use a brush-on resin to attach all the pieces. Apply the wing sections to the back side of the body. Step 6: To make the antennae, make a thin, even rectangle. Before the acrylic has totally cured, peel the rectangle off of the paper backing and use a pair small scissors to cut it into two narrow strips. Wrap one of the ends over an orange wood stick, and let it finish curing on the stick. Remove the stick and apply it to the back side of the head. Step 7: brush entire butterfly with resin to coat and seal it.